At our house even the kids are morning people. That means I have to get up REALLY early to start my morning routine before they get up. I used to get up an hour before they are allowed to get out of bed (yes they get up that early). Over the past few months I’ve fallen out of the habit and started waking up with them. An hour more of sleep should be great right? The thing is that it’s not. I wake up feeling behind, I wake up with little people who need things… right away. After struggling to find balance in our morning routine I’ve realized what’s missing. It’s the much needed Mom time I used to get every single morning. Today’s post is a message to me (and hopefully hits home for you too), because sometimes I need a good reminder of what’s working and what’s not. Waking up behind is definitely not working for me. 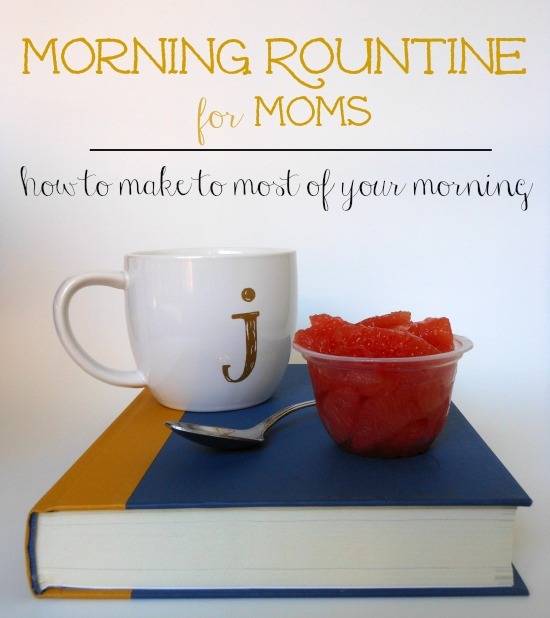 This morning routine totally counts as a Mom Win! Read 50 Mom Wins You Didn’t Even Know You Could Celebrate. This post contains affiliate links. Thanks for supporting Confidence Meets Parenting. Get up before the kids. This is the number one, most important thing for a successful morning routine. In order to get up early and still get enough sleep a good bedtime routine is really important. Get one important task done. Take a shower or do that one thing that always seems to be rushed at the end of the morning. Every morning I feel like I am rushing to make my smoothie and take my shower. Of course that’s because the kids routine is more important … or is it? When I’m up before them and have those things prepped my morning goes so much more smoothly. Put on a happy face. One of the things I’m always conscious of is how I respond to my family entering the room. I want to light up for them. I want for them to feel how excited I am to see them. When I wake up with them I’m still tired and groggy. I’m not ready to put on a happy face. When I’ve already had time to wake up it’s easy to give them the smile and snuggles they deserve. Next up? A smooth kids morning routine with more listening and cooperation! Do you wake up before your kids? If not, how different would your morning be if you did? PS. I mentioned it within the post but I can not tell you what a difference the book The Miracle Morning by Hal Elrod has made for me. It’s worth repeating. I started with a copy from the library and then bought it myself. It’s one of the few books that is always on the coffee table. This post originally appeared February 10, 2015. I have woken up a few times this week before the children but not on purpose. I do quite like having time to reassemble my brains before someone bouncily, noisily and joyfully asks me how combustion engines work. I like being able to have a hot coffee, by myself. I like being able to get breakfast ready. I might make this a habit. I love #5! You’re so smart 🙂 I need to be more conscious of that. I don’t get up before the kids. I do love it when I do – it is a better day. But I have yet to be able to successfully do it – if I wake up early – my kids do too – they hear me. Right now, they wake up earlier than me and stay in their rooms, in their beds even, quietly, until its time to get up. My littlest is the exception to this – but he’s getting better. What are your tips to get up ‘sneakily’? I wonder if just getting started would get them used to hearing you get up. Little noises and movement once in a while might have a different response than the same noises and movement happening everyday. Also, since they are already used to staying in their rooms after waking up, I think it’s fair (and even important) for you to claim some Mom time. You will give them your full attention at 6 (or whatever time) but until then you can have them stay in their rooms. What a great lesson in waking slowly for them! Do they have clocks already? We started with our kids as soon as they knew their numbers and I taped a 6 above where it would appear. If the 6 is up… then you can come out. Great insight! My kids are grown, but when they were growing up I needed to be up before them for all the same reasons as well as my time with God each day! Greeting them with a smile made such a difference. I try to do that with my grandchildren now. What would you suggest for parents of kids that wake up at 5:30? Our girls are solid 5:30am kids every.single.day. We usually don’t get to bed ourselves until 11pm (chores, work, time alone as adults). Getting up any earlier than 5:30 only causes the kids to wake up earlier as they are light sleepers (being as how we co-sleep with one). Advice? Mine would get up at 5:30 if we allowed it and are semi light sleepers. We added a clock to their room as soon as they were old enough to know their numbers. They are allowed to come out of their room “when the 6 is up”. My daughter will sleep later than my son, but he bounces right out of bed ready for the day. Putting a time helps him sleep longer I think. If he wakes up at 5:30 he knows he still has to wait a half hour so he might go back to sleep. I am really quiet in the mornings and choose to do things that make little to no noise. Our home is pretty small and I still manage to make it work MOST of the time. We haven’t co-slept so I don’t know about that one, but I’m wondering if just getting started would get them used to hearing (and feeling) you get up. Little noises and movement once in a while might have a different response than the same noises and movement happening everyday. That said… if 5am – 6am is your time, it is fair (and even important) for you to claim it. You will give them your full attention at 6 but until then you are allowed to have them stay in their rooms. They can read or look at books, spend that time playing quietly or just lay in bed and relax. Just think what a great lesson they will be learning. If your kids are too young to understand Mom time, you can start working on it now as a goal for how the house will run when they get a little older. I hope all that was helpful, it feels a little jumbled as I read over it. Definitely have the same thing going on here. I started my morning routine 2 weeks ago and suddenly my 3.5 year old is awake be for me. I try to get up at 5.30, earlier just isn’t doable for me. My 11 month old also decided it’s a good idea to wake up as early as her brother. So my mom time either starts a bit later or it’s to the soundtrack of dinosuar-frozen prinsessen going on lego train rides and I-want-to-get-up-too cries. My husband gets up at the same time and helps a lot but it’s not the same as quiet. And I so need quiet, having a not-stop brain myself. What a wonderful read Jillian! I wake up an hour before my kids do and I can totally relate as I read your share. Isn’t it amazing just how you excitedly wait for your kids to arrive everyday, and that’s my favorite part. I agree most about the ‘mom time’ part as you prepare and make sure that everything is set for your snuggle angels. That’s definitely what a mom’s gotta do. I’ve added this to my pocket! Really nice and helpful article! I strongly believe that getting up early makes your day more productive, but I am totally a night person 🙂 But, I know it’s serene to witness the beauty of morning! I usually get up with my boys. Yes, it’s rushed, but at 7 & 5, one of their morning musts is to snuggle with mom (and dad, if he’s there) in bed. It may only be 5 minutes or so, but it sets the mood for the day. My boys are upset if their snuggle time is disrupted. I realize the day will come when neither of them slip between my sheets in the quiet of the morning, and I want to relish these days for as long as possible.